Set 48-233. Colorful markings from the first air show of the 2009 season of the J-10 Chinese Demo Team. There are markings for both the single- and two-seat variants of the J-10. There are enough options on this sheet to build 1 each of any of the jets from the 2009 air show season. Two sheets of decals are included in this set. Markings include national insignia, Demo Team logo, aircraft numbers, stunning tail markings, and various red and white scallops. Decals are sized for both the Bronco and Trumpeter 1/48th scale kits. Set 48-234. More colorful markings from the first air show of the 2010/2011 season of the J-10 Chinese Demo Team. 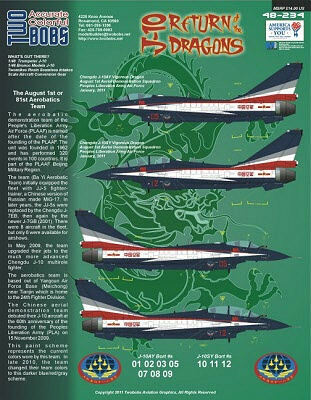 There are markings for both the single- and two-seat variants of the J-10. There are enough options on this sheet to build 1 each of any of the jets from the 2010/2011 air show season. Two sheets of decals are included in this set. Markings include national insignia, Demo Team logo, aircraft numbers, stunning tail markings, and various red and white/grey scallops. Set 48-233. The instruction sheet is 8 1/2" by 11" size and is in full color. The front sheet shows right and left side views of single-seat and two-seat aircraft. In addition, information on the individual aircraft numbers for the single- and two-seat aircraft are noted. The flip side shows top and bottom views plus suggested model paint colors, including FS numbers, to be used on the model. Set 48-234. The instruction sheet is 8 1/2" by 11" size and is in full color. The front sheet shows right and left side views of single-seat and two-seat aircraft. In addition, information on the individual aircraft numbers for the single- and two-seat aircraft are noted. The flip side shows top and bottom views plus suggested model paint colors, including FS numbers, to be used on the model. The back sheet also includes the notation that "lots of masking required for these schemes". The instructions note the suggested paint manufacturers and paint number for Testors, Humbrol, Gunze Sangyo and Xtracolor paints. Many thanks to Two Bobs Aviation Graphics and to IPMS/USA, who once again offered a wonderful opportunity to review a truly outstanding, high quality, product. Although the masking process may prove to be daunting, the end results should be award-winning, stunning models. 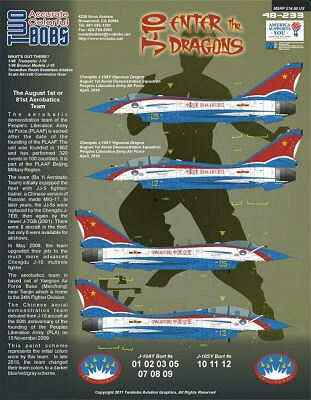 Highly recommended for those wanting to add a current PLAAF aircraft and more than a bit of color to the display shelves.